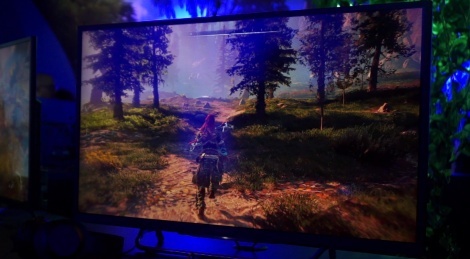 The Horizon: Zero Dawn demo shown at Paris Games Week is no different from the one we filmed in Tokyo a few weeks back, but Guerilla's game still deserves some Gamersyde coverage. That'll be all for Paris Games Week unfortunately, as we could not find anything new after briging you back so much footage from E3, Gamescom and TGS. Kudos to guts_o who had never used the camera before yesterday and without whom you would have gotten no footage at all. PS4 Pro will have 4.12 TFLOPS. He's talking about the 16bit compute. He was being sarcastic. "One of the features appearing for the first time is the handling of 16-bit variables - it's possible to perform two 16-bit operations at a time instead of one 32-bit operation," he says, confirming what we learned during our visit to VooFoo Studios to check out Mantis Burn Racing. "In other words, at full floats, we have 4.2 teraflops. With half-floats, it's now double that, which is to say, 8.4 teraflops in 16-bit computation. This has the potential to radically increase performance"
It looks great. But I'm still not sure about the gameplay. It looks very repetitive. If the only thing is the constant bow and arrow action in an open-world in order to make a new bow or arrow, this might be a boring game. It's Guerilla and that means it's very uncertain for me if I am going to like that game. Killzone was meh, Killzone 2 better but nothing too incredible, really enjoyed 3 but Shadow Fall was incredibly weak, except for the graphics. 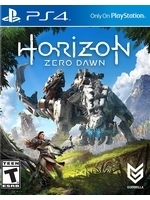 Reminds me a lot of Crytek in that regard, crazy visuals but meh gameplay. The game is getting great previews. I just hope it does not build up the hype of witcher3 like game and then fall flat. From what I have seen it will be great game but better to keep expectations on check. i think the big comparisons to the witcher stems from the fact they headhunted the witcher 3 devs, specifically side quest creators. and i think they got the writer and some other guys that made fallout new vegas. i'm not expecting a full blown RPG with huge inventories and items and loot akin to those games, but i'm expecting a very well made open world action RPG-lite. going how boring and suicide inducing the gameplay on Shadowfall was, the worst offender on a 3rd person open-world game is not having any meaningful "sandbox" interaction with the world or the gameplay mechanics not being remothely fun, like a mediocre game as watchdogs. this seems like its in borderline of that. I men... gun play that only works when you can actually aim with game locked slow-down? where is the pro players depth at? All in all, it just comes as various somewhat shallow demos being shown, very "vertical slice don't deviate from the path or it breaks" that end in a cool at lest very nice and hard boss battle with the scorpion thinghy. the explosion/stunned animation is horrible, they need to give naughty dog treatments to some of the girl animations, most of them she seems more robotic than the enemies.